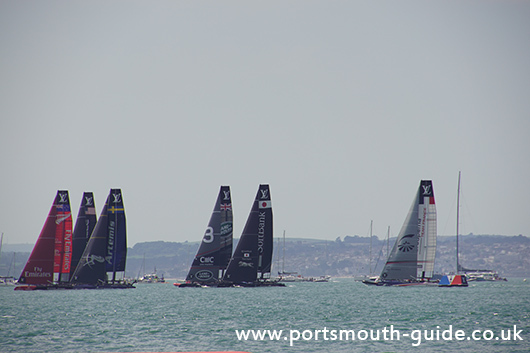 The America's Cup came to Portsmouth from 23rd to 26th July 2015. The America's Cup is a trophy awarded to the winner of the America's Cup match races. The trophy was originally awarded in 1851 by the Royal Yacht Squadron for a race around the Isle of Wight which was won by the schooner America. The trophy was renamed the America's Cup after the yacht. The history and prestige associated with the cup attracts not only the world's top sailors and yacht designers but also the involvement of wealthy entrepreneurs and sponsors. In the 164 years since the first race, only four nations have been victorious. 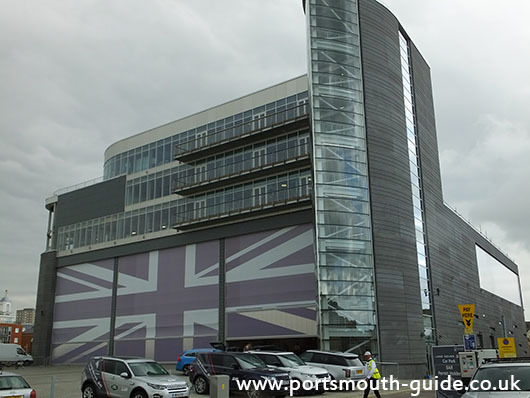 The Land Rover BAR team was launched in June 2014 and have built their base in Portsmouth. Construction work started in July 2014 with the work being completed in June 2015. 2015 save the opening event of the 2017 Louis Vuitton America's Cup World Series being held in Portsmouth. The event took place between 23rd and 26th July 2015. Teams from the UK, France, Japan, New Zealand, Sweden and USA took part. For the four days Southsea Seafront was turned into an arena to watch the spectacular events unfold on the sea with a Waterfront Arena and Fanzone Arena being setup. Over 300 Wave Makers, who are volunteers, were on hand to help the hundreds of thousands of visitors who flocked to the event. Events started at 10am on 23rd when the race village opened. There was a parade of sail, the trophy arrived and teams displayed their boats on the Solent. In the evening the Royal Marines Band performed to a packed crowd. Unfortunately the summer weather of 23rd did not hold for Friday 24th but despite the rain huge crowds turned up to watch the event. The teams left Portsmouth's Royal Naval base in a parade of sail before they took part in practice races. Saturday 25th July saw the competition start in earnest, the sun returned and the first races took place. The evening saw a massive open air concert featuring Spandau Ballet, Wet Wet Wet, McBusted and Carly Rae Jepsen. On Sunday 26th HRH The Duke of Cambridge and HRH The Duchess of Cambridge came to Portsmouth to witness the spectacle of the America's Cup. They toured the technical area at Portsmouth Naval Base before heading to BAR HQ and then on to Southsea Seafront to see the racing. Unfortunately, due to driving rain and strong winds racing was called off early. This left the UK's Land Rover BAR the winning team in this heat of the racing. The America’s Cup returned to Portsmouth between 21st and 24th July 2016. On 21st was a media and children’s day with public days taking place from 22nd to 24th July. The event opened to fantastic blue skys which meant on the Friday the teams were able to complete 4 races as well as having the Red Arrows perform a magnificent display. On Friday the Duke of Edinburgh visited BAR Racing and took in the spectacle of the racing and on Sunday the Duke and Duchess of Cambridge attended the event. 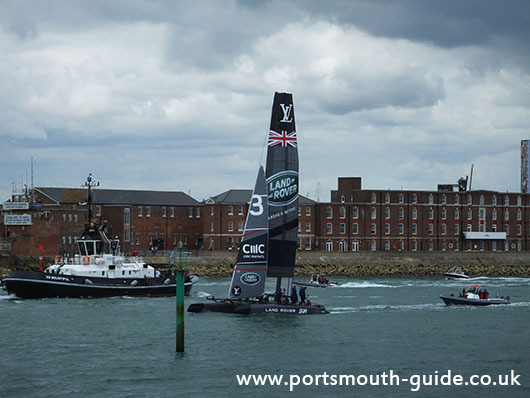 Saturday and Sunday saw the weather remain good and races took place with the team Land Rover BAR winning the Portsmouth leg of the Americas Cup overall. The race village saw a new format compared to the previous year which was very well organised and offered great glimpses into the technology involved in the racing. There was an aerial display every day of the event and lots for people to do with crows flocking to take in the spectacle on Southsea seafront. At the end of racing on Sunday the points stood at: Land Rover BAR first with 367 points, Oracle Team USA second with 366 points, team New Zealand third with 357 points, SoftBank Team Japan 328 points, Artemis Racing 315 points and Groupama Team France 292 points. The winner of all the heats will race team USA in 2017 in Bermuda.